The desired swath width can easily be obtained by loosening the handle on each side and moving the adjustable swath deflectors to the desired position. Swath width is adjustable from 1.4 m to 2.0 m (4 ft, 7 in. to 6 ft, 6 in.) on the 131 Front-Mounted Mower-Conditioner. The available room for a windrow is a function of wheel spacing and tire width. 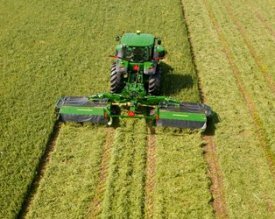 The windrow width of the 131 Front-Mounted Mower-Conditioner may be narrower than the windrows from a 388 Twin Rear-Mounted Mower-Conditioner if the forming shields are adjusted so the tractor does not drive on the windrow that is produced. A wide spread kit is available as a field-installed bundle. This kit is composed of vanes installed under the conditioning hood. The crop flow is spread to approximately the machine working width and offset about 400 mm (15.75 in.) on the left-hand side. This allows a clean separation between the uncut crop and spread crop. Power is transmitted from the 1000-rpm PTO on the front of tractor through gearcases to the cutterbar. Standard position for main gearcase utilizes clockwise (as determined by direction of travel) rotation of the front PTO. The high-speed rotary disks cut in the toughest conditions. The disks rotate at 2986 rpm. Low-profile design enables cutting close to the ground at a flat angle helping prevent damage to the disks and knives. 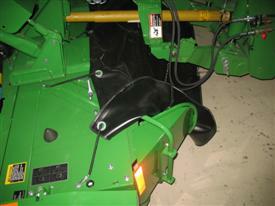 Cutting height is adjusted by changing the turnbuckle on the front hitch. Cutting range is from 30 mm to 80 mm (1.2 in. to 3.15 in.). The mower-conditioner is equipped with 54 free-swinging, steel impeller tines. 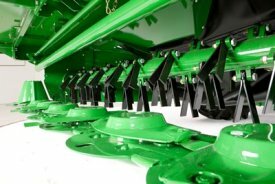 This John Deere conditioner provides excellent conditioning performance and fluffy windrows. The impeller conditioner works well in legumes, especially alfalfa and most all-grass crops. Impeller conditioners are not recommended for thick-stemmed or cane-type crops, such as sudan or sudex, or crops over 5-ft tall. As hay is cut by rotating knives, tines (2) pick up the plants and carry them through the machine: Tines are free swinging to reduce damage to the conditioner if rocks or other solid objects are struck. As the plant passes through, it rubs against the conditioning hood (1) and other plants: Scuffing action removes the waxy surface from the stem of the plant to allow faster evaporation of moisture. The pivot point for the conditioning hood is also adjustable to provide a wider range of conditioning intensity. The speed at which the tines rotate will also affect the degree of conditioning. Two impeller speeds can be achieved by interchanging the upper sheave and the lower sheave. With the sheaves in the position shown, the impeller turns at 888 rpm; this is ideal for grasses. If the sheaves are reversed, the impeller turns at 615 rpm; this is ideal for legume crops. Unmatched productivity is gained with cutting widths up to nearly thirty feet in one pass along with a narrow transport width. 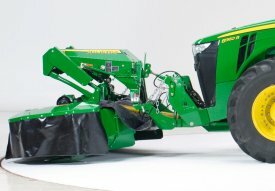 The A-frame adapter enables quick and easy installation of the 131 Front-Mounted Mower-Conditioner. The adapter attaches to the tractor’s front 3-point hitch and locks into the mating headstock that is part of the mower-conditioner. 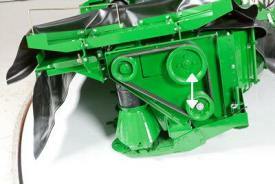 Down stop chains are include for use with tractors, such as the 8R, without front hitch position sensing. 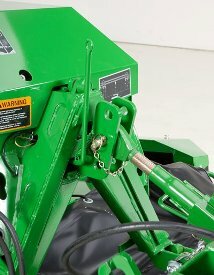 A front chain support kit (RE327692) is required to connect the down stop chains on an 8R Tractor. The 7R Tractors are equipped with position sensing that has the ability to establish front hitch set points from the CommandCenter™. Position sensing will maintain the height of the hitch arms based on the set point. 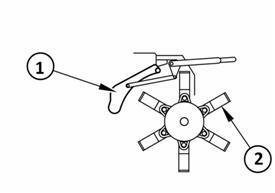 The front chain support kit (RE327692) is not required for 7R Tractors, but damage to the front PTO driveshaft can occur if the front hitch positioning is not set correctly, or if the set point is manually overridden. Hydraulic cylinders are used to raise and lower the cutting platform when crossing headlands. Uses single-acting selective control valve (SCV) to raise platform. Lift cylinder operation must be independent of the front hitch operation.